« I like New York! But as we mourn the destruction of New Orleans, those of us in San Francisco can’t help but remember that before Katrina it was our own city that held the title of “worst disaster”” and may yet again! Of course we all know that an active fault line rumbles beneath our feet, threatening to shake our city into rubble. But we also face looming disaster in the form of rising waters, as global temperatures (due, in no small measure, to the global car culture) raise the shoreline, and no one really knows how high it will go. 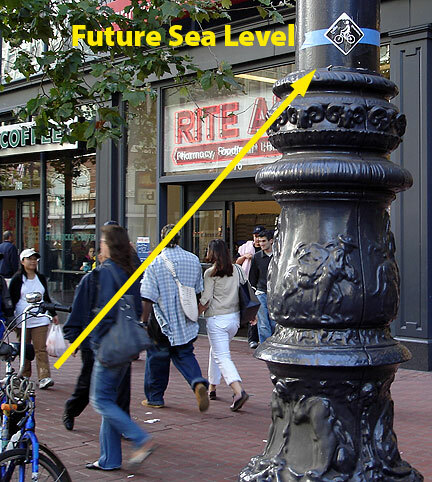 To acknowledge this fact, we propose a route along our current shoreline southward and through what was once Mission Bay before turning north and tracing a route along the FUTURE shoreline at a line approximately 15 feet above the current sea level. Many times we will traverse the original shoreline too, long ago filled in with sand and soil from San Francisco hills that are no more. FEMA, the Federal Emergency Manipulation Agency, is blamed for flubbing the relief effort in New Orleans. But FEMA has done its job perfectly! It has channeled billions in relief funds directly to the same businesses that have profited so handsomely from the destruction of Iraq. No doubt the same insider corporations” like San Francisco’s Bechtel” are now lining up for a chance to “rebuild” the birth clinic of the “new Middle East” in Lebanon. FEMA’s job is to preserve and extend class divisions in the U.S. Disasters like Katrina are opportunities for radical social engineering on behalf of society’s owners. It’s not incompetence when FEMA makes the disrupted lives of New Orleans’s poor and black population into a story of permanent displacement, bur rather it’s a long-cherished goal of the city’s wealthy owners. FEMA is the federal government’s velvet-gloved fist to smash communities that have ideas of their own, dividing people to ensure confusion, isolation and dependency. The next step is to blame the victims for their condition. After months or years of delay and inadequate support, the dispersed and atomized victims are abandoned to their fates, urged to get on with their new lives. 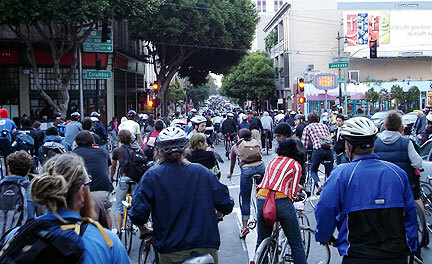 When we bicycle together in Critical Mass we’re engaged in a very different kind of radical social engineering. 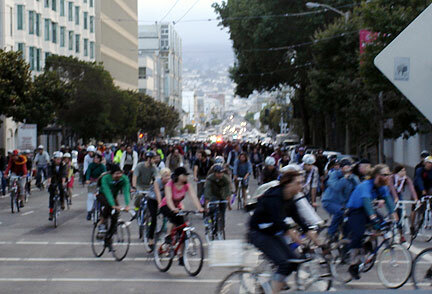 Critical Mass is a monthly practice of spontaneous collec-tive cooperation and self-direction, just the opposite of a militarized bureaucracy like FEMA. More importantly, Critical Mass is an actively maintained social vaccination against the kind of isolation and despondency FEMA creates and enforces. Communicating in the heat of the moment, solving problems face to face, cooperating with people we otherwise haven’t had much contact with, are all practical skills in disaster preparedness. And let’s face it, when the streets are filled with quake rubble, the bicycle will become the transportation of necessity, just like it was in 1906. We cannot delude ourselves about how bad the world is, how much worse it’s gotten since we started riding before Clinton’s first election. In this age of cynicism, an unforgiving world is made meaner and colder by the haughty self-righteousness of venal government and business leaders, unapologetic profiteers and brazen war criminals who think they can escape justice forever. They won’t, but no thanks to Critical Mass cyclists, who don’t address this larger drama. We don’t leave, or haven’t yet, our self-defined limits of a rolling monthly seizure of the streets (a mere bike ride? hardly!) to contest the larger culture in other ways, but maybe that’s OK.
Few of us are passive witnesses to this madness. During our daily lives we discuss and imagine alternatives all the time. We help each other live better lives through mutual aid and cooperation. Many people are tinkering in the growing mountains of waste to invent new homegrown technologies that anticipate the problems facing future post-oil survival. With a growing embrace of a broader ecological agenda, our small acts of resistance and renewal are already shaping the world to come. Our common wealth will be based on locally produced organic foods, wind and solar electricity, bicycling and recycled biofuels, restored habitats and daylighted waterways, vibrantly creative and diverse artistic cultures of free expression and easy-going tolerance, new combinations of urban and rural, and a media renaissance providing unprecedented breadth and depth in proliferating forms and outlets. Freed from the rigid limits imposed by profit-seeking, scientists could address problems they consider “unrealistic” today. Medical care can open up to many of the world’s traditions, leading to new ideas about health, sickness and treatment. We can decide together what work is worth doing and what stupid and destructive work should stop immediately. Who knew that riding home together once a month could open the space to imagine such a different world? How many of us realize that we’re already pedaling in the right direction? See you next month at the birthday ride. (our “organized coincidence” will celebrate its 14th birthday, having started here in September 1992 before spreading around the world). Lure/invite a car commuter you know to join us in September. While riding today, surprise people with warmth and open-minded curiosity. Judge not lest you be judged for being judgmental! Here’s the ride going east on Jackson crossing Columbus. This is after a long twisting ride through Mission Bay, across the edges of Potrero Hill (where the shoreline will be when the seas rise 15 feet), into the Mission, and then downtown on Folsom. Here’s the back of the ride turning onto 3rd from Folsom. Adam A.’s much better and closer pictures are on-line here. The proposed route made some of the young “testosterone brigade” types angry. People who have only ridden for the past few years have no memory of how we “did it” for all those early years, where there were routes, flyers, arguments, discusssions of etiquette, handouts for passersby, etc. So they angrily argued with me that there was no place for a route at Critical Mass and that the point was to go to the densest part of town and block cars and make people angry! I was surprised at hearing that articulated by one young man and we got into a long argument while riding down 7th street. I may have to migrate South for this anniverasary ride. The tunnel is fun but the firecrackers inside the tunnel was so loud it startled many people. Cant wait for next months CM celebrating its 14th Birthday. Great blog!